IntelliScanner Kitchen Companion | OhGizmo! I live approximately 15 feet from a large grocery store, so the hardest part of restocking the fridge is putting on my shoes. For a large family though ensuring the pantry remains full can be a full time job. 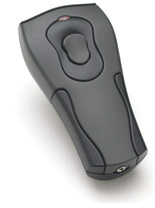 The IntelliScanner Kitchen Companion is a handheld barcode scanner that is designed to make keeping inventory of your consumables an easy process. As you put away your groceries you scan each item with the Kitchen Companion and then connect the unit to your computer to upload the database to its own software. As various items get used you scan them again, this time to remove them from the database. When it’s time to do the grocery shopping the software will automatically produce a list of what’s needed that can be easily exported to your iPod, Palm device, Pocket PC or cellphone. The Kitchen Companion software will recognise some 300,000 U.S. grocery items, and can be updated via the internet. It also has the USDA’s National Nutrient Database built-in allowing you to access nutritional information for any item in your kitchen. The Kitchen Companion is available as a tethered version (always attached to your computer) for $149 or a portable version (take it anywhere and sync to the computer via serial cable or Bluetooth) for $249. Sounds like a pretty big hassle just to, you know, eat. yeah. we need one that can read RFID tags. Put a scanner by the door and a scanner by the trash can. And cost under $100. Then it would be cool.